A building in the path of wind causes wind pressure which in turn causes force, shear, and overturn moment at each level that must be resisted, following a load path to the foundations (wind wall pressure transfers to horizontal diaphragms, then to shear walls, finally to foundation). Wind pressure times tributary area per level causes lateral force per level. Shear per level, the sum of wind forces above, defines required resistance. Overturn moment per level is the sum of forces above times their height above the respective level. Mx = overturn moment = sum of all forces above times their distance above level x. Wind channeled between buildings causes a Venturi effect of increased wind speed. Air movement through buildings causes internal pressure that effects curtain walls and cladding design. Internal pressure has a balloon-like effect, acting outward if the wind enters primarily on the windward side. Openings on leeward or side walls cause inward pressure. In tall buildings with fixed curtain wall the difference between outside wind pressure and interior pressure causes air movement from high pressure to low pressure. 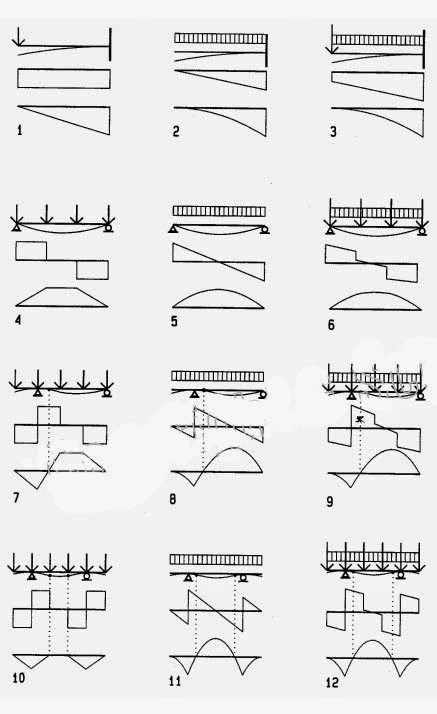 Deflection, shear, and bending diagrams are shown here for typical beams. The beam with deflection and load diagrams are drawn on top with shear and bending diagrams shown below. With experience, these diagrams may be drawn by visual inspection prior to computing. This is useful to verify computations and develop an intuitive sense and visualization regarding shear and bending on beams. The deflection diagram is drawn, visualizing the deflection of a thin board, flexible ruler, or similar device. It is drawn grossly exaggerated to be visible. The shear diagram is drawn at a convenient force scale left to right, starting with zero shear to the left of the beam. Downward uniform load yields downward sloping shear. Downward point loads are drawn as downward offset, and upward reactions yield upward offset. Bending diagrams are drawn, considering the area method; namely, bending at any point is equal to the area of the shear diagram up to that point. Both, shear and bending must be zero to the right of the right beam end. To satisfy this, requires a certain amount of forward thinking and, in complex cases, even working backward from right to left as well as left to right. This beam, supporting a column point load of 96 k over a door, is a composite beam consisting of a wide-flange base beam with 8x½ in plates welded to top and bottom flanges. The beam is analyzed with and without plates. As shown before, for steel beams shear stress is assumed to be resisted by the web only, computed as fv = V/Av. The base beam is a W10x49 [10 in (254 mm) nominal depth, 49 lbs/ft (6.77 kg/m) DL] with a moment of inertia Ixx= 272 in^4 (11322 cm^4). Shear in the welds connecting the plates to the beam is found using the shear flow formula q = VQ/(I). Since the beam would fail in bending, a composite beam is used. Since the shear force remains unchanged, the web shear stress is still ok. Note: in this steel beam, bending is stress is more critical than shear stress; this is typical for steel beams, except very short ones. Since this is not a rectangular beam, shear stress must be computed by the general shear formula. The maximum shear stress at the neutral axis as well as shear stress at the intersection between flange and web (shear plane As) will be computed. The latter gives the shear stress in the glued connection. To compare shear- and bending stress the latter is also computed. For the formula v= VQ/(Ib) we must find the moment of inertia of the entire cross-section. We could use the parallel axis theorem of Appendix A. However, due to symmetry, a simplified formula is possible, finding the moment of inertia for the overall dimensions as rectangular beam minus that for two rectangles on both sides of the web. At 30 ft span bending stress is just over the allowable stress of 1450 psi. This shows that in short beams shear governs, but in long beams bending or deflection governs. Based on the forgoing general derivation of shear stress, the formulas for shear stress in rectangular wood beams and flanged steel beams is derived here. The maximum stress in those beams is customarily defined as fv instead of v in the general shear formula. Note: this, too, confirms an intuitive interpretation that suggests zero stress since no fibers above the beam top could resist shear. 4 Shear stress distribution over a rectangular section is parabolic as implied by the formula Q=b(d^2)/8 derived above. 5 Shear stress in a steel beam is minimal in the flanges and parabolic over the web. The distribution of shear stress over the cross-section of beams is derived, referring to a beam part of length x marked on diagrams. Even though horizontal and vertical shear are equal at any part of a beam, horizontal shear stress is derived here because it is much more critical in wood due to horizontal fiber direction. v = horizontal shear stress. the moment of inertia of a rectangular beam of homogeneous material. A formal calculus derivation of this formula is given in Appendix A. The section modulus gives only the maximum bending stress, but the moment of inertia gives the stress at any distance c from the neutral axis as f= Mc/I. This is useful, for example, for bending elements of asymmetrical cross-section, such as T- and L-shapes. Rectangular beams of homogeneous material, such as wood, are common in practice. The section modulus for such beams is derived here. 1 Stress block in rectangular beam under positive bending. 2 Large stress block and lever-arm of a joist in typical upright position. 3 Small, inefficient, stress block and lever-arm of a joist laid flat. Referring to 1, the section modulus for a rectangular beam of homogeneous material may be derived as follows. The force couple C and T rotate about the neutral axis to provide the internal resisting moment. C and T act at the center of mass of their respective triangular stress block at d/3 from the neutral axis. The magnitude of C and T is the volume of the upper and lower stress block, respectively. C = T = (f/2) (bd/2) = f b d/4. where S = bd2/6, defined as the section modulus for rectangular beams of homogeneous material. This formula is valid for homogeneous beams of any shape; but the formula S = b(d^2)6 is valid for rectangular beams only. For other shapes S can be computed as S = I /c as defined before for the flexure formula. The upright joist is six times stronger than the flat joist of equal cross-section. This demonstrates the importance of correct orientation of bending members, such as beams or moment frames. The flexure formula gives the internal bending stress caused by an external moment on a beam or other bending member of homogeneous material. It is derived here for a rectangular beam but is valid for any shape. Both the moment of inertia I and section modulus S define the strength of a cross-section regarding its geometric form. Indeterminate beams include beams with fixed-end (moment resistant) supports and beams of more than two supports, referred to as continuous beams. The design of statically indeterminate beams cannot be done by static equations alone. However, bending coefficients, derived by mechanics, may be used for analysis of typical beams. The bending moment is computed, multiplying the bending coefficients by the total load W and span L between supports. For continuous beams, the method is limited to beams of equal spans for all bays. The coefficients here assume all bays are loaded. Note: stress is figured, using absolute maximum bending and shear, regardless if positive or negative. Lumber sizes are nominal, yet actual sizes are used for computation. Actual sizes are ½ in. less for lumber up to 6 in. nominal and ¾ in. less for larger sizes: 4x8 nominal is 3½x7¼ in. actual. Note: in the above two beams shear stress is more critical (closer to the allowable stress) than bending stress, because negative cantilever moments partly reduces positive moments. I Inflection point (change from + to - bending). Note: increased beam width is most effective to reduce shear stress; but increased depth is most effective to reduce bending stress. • The shear at any point n is equal to the shear at point m plus the area of the load diagram between m and n.
• The bending moment at any point n is equal to the moment at point m plus the area of the shear diagram between m and n.
where w x is the load area between m and n (downward load w = negative). where Vmx – wx^2/2 is the shear area between m and n, namely, the rectangle Vm x less the triangle w x^2/2. This relationship may also be stated as Mn = Mm + Vx, where V is the average shear between m and n.
By the area method moments are usually equal to the area of one or more rectangles and/or triangles. It is best to first compute and draw the shear diagram and then compute the moments as the area of the shear diagram. • Positive shear implies increasing bending moment. • Zero shear (change from + to -) implies peak bending moment (useful to locate maximum bending moment). • Negative shear implies decreasing bending moment. Even though the forgoing is for uniform load, it applies to concentrated load and non-uniform load as well. The derivation for such loads is similar. To find the distribution of shear and bending along the beam, we investigate the beam at intervals of 5’, from left to right. This is not normally required. Bending moment Mx at any distance x from left is found by ∑ M = 0.